Product code: ES7805 Categories: Art Deco, Art Deco Rings & Art Deco Engagement Rings. Here is a ring that is the epitome of the Art Deco era, a truly magnificent and incredible Art Deco sugar loaf cut emerald and diamond ring by A W Crosbee and Sons. Hand made in 18ct white gold and platinum, the ring is set with a sugarloaf cut emerald, this particular cut of gemstone is akin to a cabochon cut with somewhat pointed sides. This results in a stunning effect and accentuates the ring as a real showpiece. With the emerald having a fantastic green colour to it, it measures 2.10 carats and is highlighted by a border of diamonds. However the diamonds are not simply set around in a square border, but the claws are also set with diamonds that lead up onto the emerald. It is the combination of the wonderful cut of the emerald and the setting for the diamonds that really shows the thought of design and craftsmanship of the ring during the fabulous Art Deco period, and why Art Deco jewellery has always remained so popular. In total there are twenty two diamonds surrounding the emerald and three more on each claw, and these diamonds come together to total 0.28 carats and accentuate the ring perfectly. Measuring 12.5mm from left to right by 11.6mm in height, there is no doubt that this is one of the most amazing and incredible example of an Art Deco emerald and diamond ring. Maker: A W Crosbee & Sons. Tag: Art Deco sugar loaf cut emerald and diamond ring. A brief history on AW Crosbee and Sons. In 1902 Arthur Walter Crosbee opened his workshop as AW Crosbee & Co at 7 Wyse St Birmingham. In 1931 the business changed to AW Crosbee and Sons. 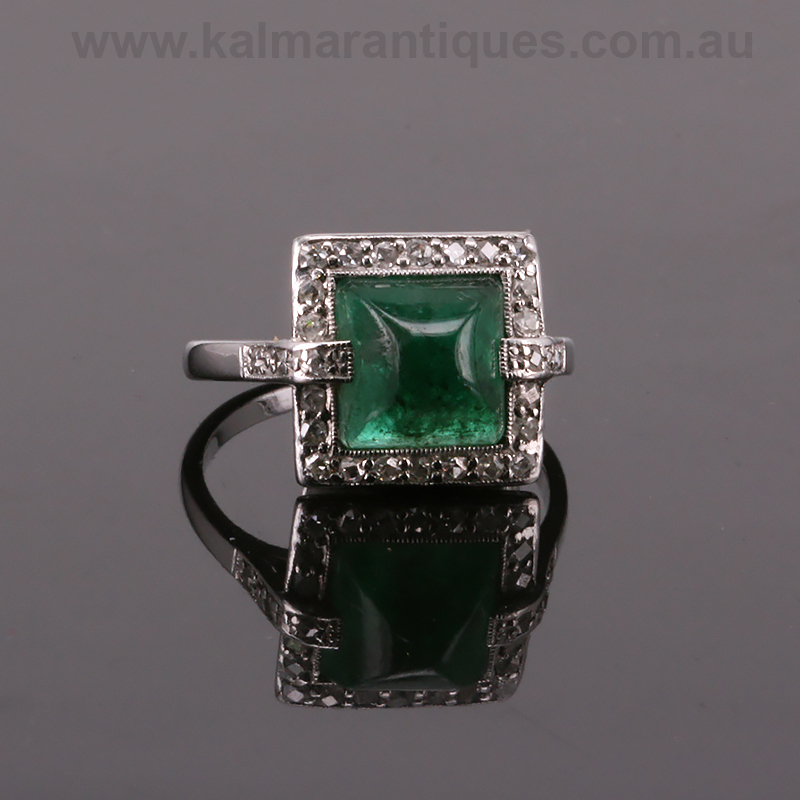 This Art Deco emerald and diamond ring is set with a sugarloaf cut emerald. A sugar loaf cut is a cabochon cut gemstone with somewhat pointed sides. Very popular during the Art Deco period, this cut of gemstone has come back into popularity in recent years.